Today’s Final Jeopardy answer and question (The Latin Vulgate Bible), the August 22, 2018 College Championship semifinal encore presentation between Alli Ross, Rishab Jain, and Dhruv Gaur. Today’s Final Jeopardy answer and question (Exploration Name’s The Same), the August 15, 2018 College Championship quarterfinal encore presentation between Caroline Trammell, William Scott, and Rishab Jain. 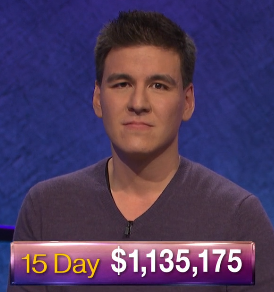 Andy Saunders of thejeopardyfan.com discusses Jeopardy’s 2018 College Championship with tournament competitors Dhruv Gaur, Rishab Jain, Sheldon Lewis II, and Rebecca Rosenthal! Today’s Final Jeopardy answer (in the category The Latin Vulgate Bible) and game statistics for the Wednesday, April 18, 2018 College Championship semifinal between Alli Ross, Rishab Jain, and Dhruv Gaur. Here are the semifinalists in the 2018 Jeopardy! College Championship along with their quarterfinal stats!